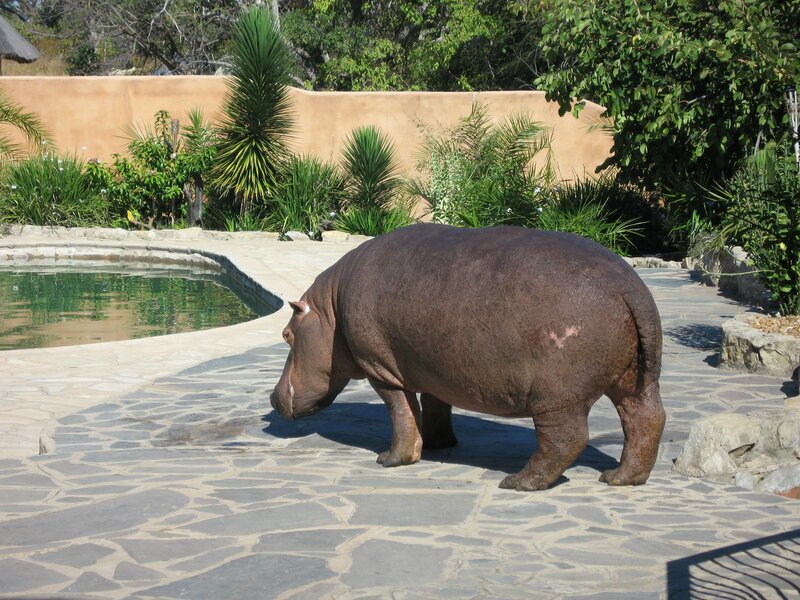 Thanks to a family trip, Kimba got to go to South Africa. 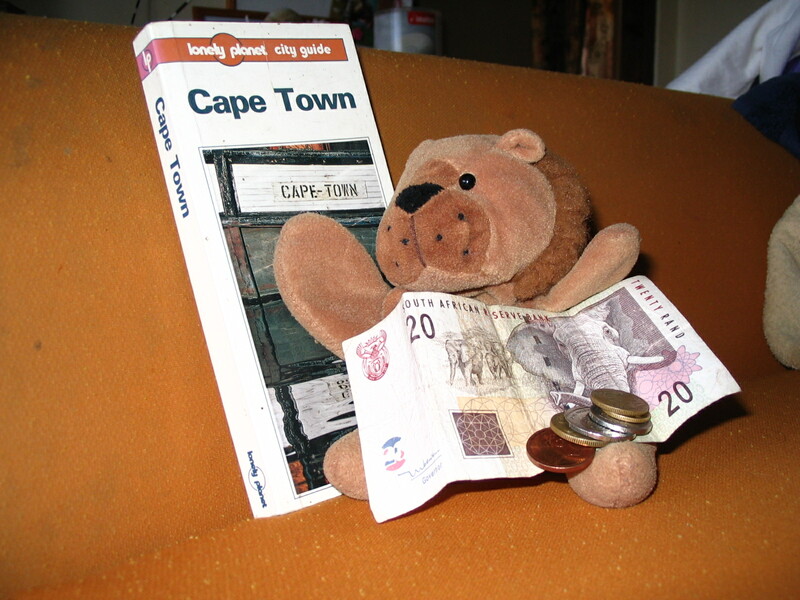 Unfortunately, however, the silly lion forgot his camera–so I shall have to rely on his travel souvenirs in order to show you that he had a lovely time in Johannesburg and in Durban! When I asked my friends about the show, they said, with a sort of matter-of-fact indifference, that is was an educational program, teaching Zambians about the spread of HIV and about how they must not be afraid of, or discriminate against, those with the disease. It strikes me that the problem with this approach may be that, while the disease is indeed everywhere, those who are ill either do not know it or will not admit it—to anyone. I think of a man whose employers found him immobile in his hut when they went to see why he had been missing from work. Taking him to be tested for HIV, they found their suspicions correct, and so they signed him up for the Antiretroviral Therapy, free thanks to internationally funded relief programs. He is now doing well, a year later, working and apparently healthy—but to this day he refuses to tell his own wife that he is infected. Talking with some missionary friends recently in Ndola, they confirmed that they too knew of many such instances. Here in Zambia there is a strong cultural taboo against the disease—a taboo which is combined with a resigned acceptance of promiscuity that comes in the form of affairs, multiple wives, and the like—clearly, a deadly combination. And a hugely daunting problem, in the grand scheme of things. So when I start to think about it, I worry, and I wonder what can be done. But frankly, I haven’t the slightest clue how to begin in this realm: this sort of relief and development work is way out of my teacher/librarian/writer league. Beyond that, I am increasingly aware, as the years go by, of my limitations [though I spent my early years fearlessly assuming I could do anything and everything]; I am simply not one to do great things, in terms of accomplishments. What then, can I do? Perhaps all I am meant to do is build up those around me. In some small measure, if I can encourage and empower the people in my sphere of influence, I may be able to influence in some way, when it would be pointless [and perhaps detrimental] to try to change behaviors and cultures. This, I suspect, is why I was struck by the urge to make a small gift to a friend in the village. It was a photo of a stunning West African woman, staring frankly into the camera, with a caption that read “I am powerful.” I made a simple matting and a frame for the photo, and took it to her, explaining that it made me think of her when I saw the beauty and strength of this woman’s face. My friend cannot even read the words herself, but my hope is that in small way this reminder that now hangs by her bed can keep her mindful of the inherent, God-given worth that she must never compromise for the sake of empty words and human frailties. At dinner the other night I asked Eva if she had told Mom and Dad about her goofy direct object lesson that day. When she said she hadn’t, I asked why not, to which this sensitive youngster replied that she didn’t want to make fun of her teacher. My encouragement did not seem to persuade her so I finally informed her that I would then make fun of her teacher . . .
You see, we happened upon a rather unusual, but quite effective, method for learning the difficult lesson of how to identify the direct object of a sentence. As we wrestled that day with how to distinguish between nouns and predicates, subject nouns and common nouns, and, of course, direct objects, I had a bit of a teacher’s “Aha!” moment. As I began to explain how to decipher the direct object, I discovered a little trick: a simple way to locate it is to read the sentence once and then reread it, eliminating the end and replacing it with the question “what?” For instance, “My dog ate a large bone. My dog ate a large what? A bone!” And so you have discovered the direct object—“bone,” in this case. I believe this is a relatively standard method for teaching direct objects. What I realized that day, however, is that when you start going through a series of sentences, a bit of a rhythm develops. So as I illustrated this method, I began to lapse into a rhythm, which morphed into a bit of a rap, which led to the obvious next step of dancing as I rapped. When I recovered from the losing-myself-in-the-moment syndrome and glanced at my pupil, I found her wide-eyed with delight. So I continued. She quickly caught on when I paused after the sentences to allow her to insert the “what” of the direct objects. And so we rapped through a page of her work. Until one of her answers made me stop—I realized she had given an incorrect reply, so I stopped to correct her. And stopping the rhythm of course interrupted the routine. When Eva commented that I had stopped dancing, I replied that her goal was “to keep teacher dancing.” By this point, both girls were getting into the game, and we laughed our way through the entire lesson for Eva’s English that day. In the process, I believe we also managed to give Ellen a head start, as I suspect she will remember our little trick once she reaches the same point in her grammar lessons. Sometimes it behooves a teacher to be willing to be a bit of a goofball. who’s hanging out by your pool? Giving a new perspective on fear of wearing a bathing suit in public . 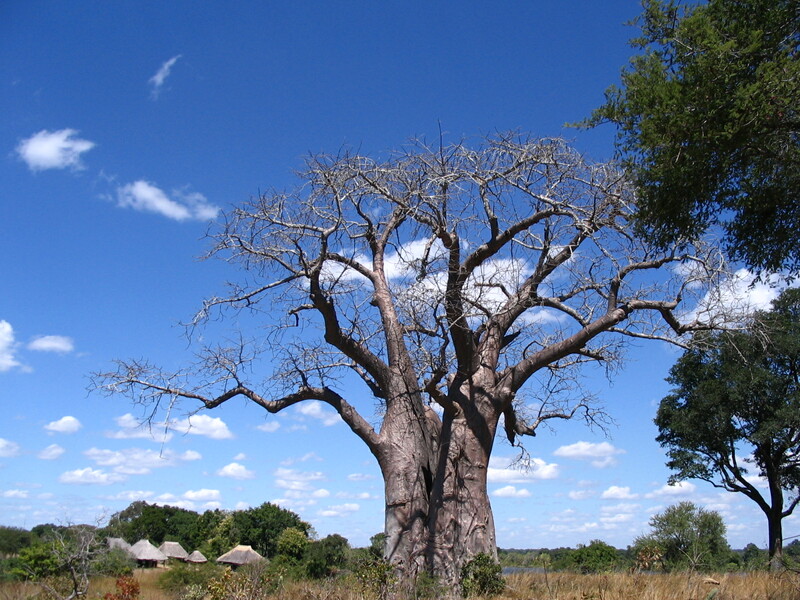 . .
Another favorite Baobab of mine, along the vein of my previous “sight so lovely” post. the post i almost didn’t post, and may still decide to un-post . . . This week has thrown my people-pleasing, affirmation-driven self for a loop. I pray that the worst of it is over, and can’t quite see how it could be any more difficult. But it has no doubt been a good growing experience. I have been forced to realize that sometimes one just has to grow up and take the crud as it comes. In the middle of a barrage of unexpected, unwelcome stresses, sometimes you just have to step forward, one baby step at a time, and pray for the strength to get through it. I think on some level I have been holding on to a notion that I can make my life work out at least somewhat the way I want it to. Perhaps that comes from being forced out of childhood too early, and so being a bit of a control freak ever since: an intense upheaval at a crucial age in childhood has maybe created a need to feel that things can’t get too out of hand, or too crazy, ever again. But you can’t really count on that, huh? And I am realizing new levels of an inner ability to keep moving when all my senses tell me that I have no tangible support to grab onto any longer. So here I am. Moving forward. I don’t necessarily know why, or towards what, but I push on. Realizing that sometimes you just have to be a big girl and remind yourself who you are, even if no one cares. Pressing ahead in doing what I know to be right, loving those I know my job it is to love, and patiently waiting out this dark time. Waiting for a light at the end of the tunnel. Believing beyond hope that God still works miracles. That He, if no one else seems to, really cares about me. That He really is making something worthwhile out of my life.